I’m pleased to present this guest post by Megan Moynahan. Megan is the Executive Director of the Institute for Functional Restoration, a non-profit organization with the mission to restore function to people with paralysis. In celebration of the 300th anniversary of the original Longitude Prize, the BBC has recently announced that Nesta and the UK’s Technology Strategy Board have launched the Longitude Prize 2014, an effort “to help solve one of the greatest issues of our time.” The catch is that British citizens first get to vote on which challenge area is “the greatest issue” worthy of the £10,000,000 prize purse. The candidate challenge areas are all worthy causes, but here’s my plug for why you should vote for the Paralysis Prize, a challenge to restore movement to people with paralysis. In crafting the Paralysis Prize, the developers recognized that while a cure for spinal cord injury is still the holy grail, it is far from becoming a reality due to the complexity of the problem. 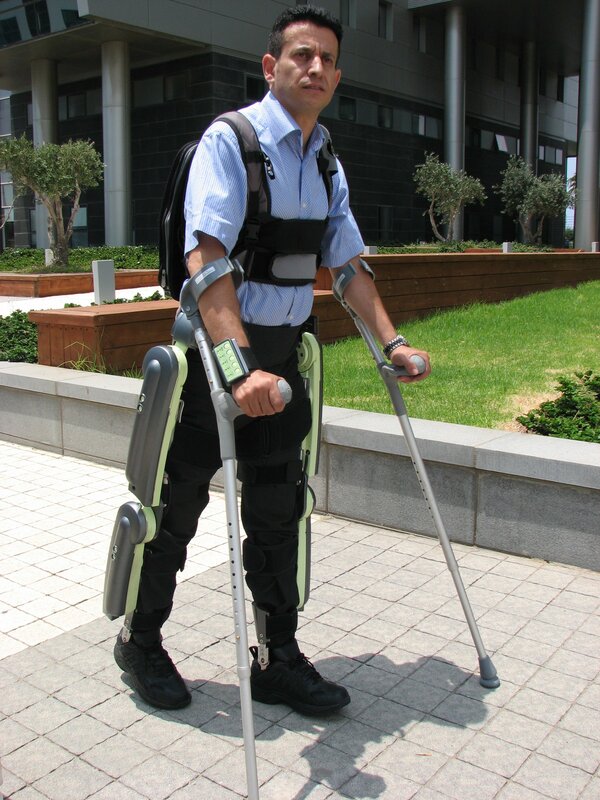 However, in the meantime there are amazing technologies that are being developed that could help restore specific functions to people with paralysis to help them become more independent, to reduce caregiver burden, and to address a multitude of health issues related to their condition. Living with paralysis is associated with higher rates of kidney failure, pneumonia, infections due to pressure sores, osteoporosis, scoliosis, muscle atrophy, and respiratory complications. Giving people the ability to move again, to stand again, to use their hands again, frees them to live more independent, productive lives with fewer medical complications. You can expect some unbelievably cool technologies lining up to compete for this prize. Paralympian Jen French standing with the aid of a 24-channel neurostimulator developed at Case Western Reserve University. While most people tend to fixate on solutions that “get rid of the wheelchair,” the fact is, most people with paralysis look for solutions to many of the other deficits of paralysis, as noted in the TEDx talk I recently gave alongside Paralympian silver-medalist Jen French. The neuromodulation (“functional electrical stimulation”) systems developed at Case Western Reserve University offer hope of restoring an astonishing array of functions for people with spinal cord injury and stroke, including standing, stepping, hand grasp, postural control, bladder and bowel function, and respiration. 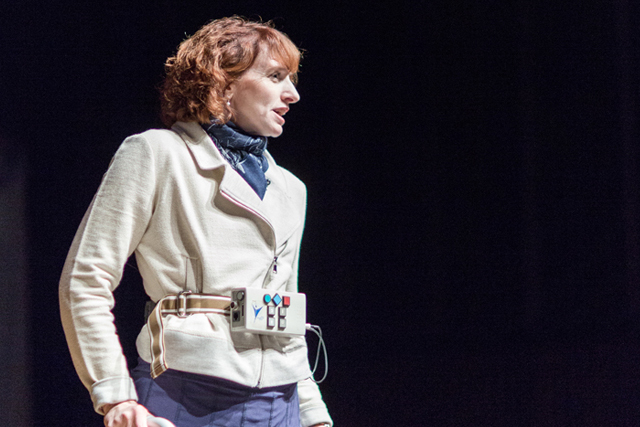 Exoskeletons, or “wearable robots,” are captivating the imagination of the lay public in recent years, featured in an episode of Glee and on the TED stage. And this month we may see the first person with paralysis give the opening kick at this year’s World Cup soccer tournament in Brazil, with the help of an exoskeleton. In recent weeks, the medical community and popular media outlets have been buzzing with the news out of the University of Louisville on the stunning functional improvements observed in four men with paralysis following epidural (spinal column) stimulation. Could this be the solution that allows people with paralysis to regain multiple functional movements? 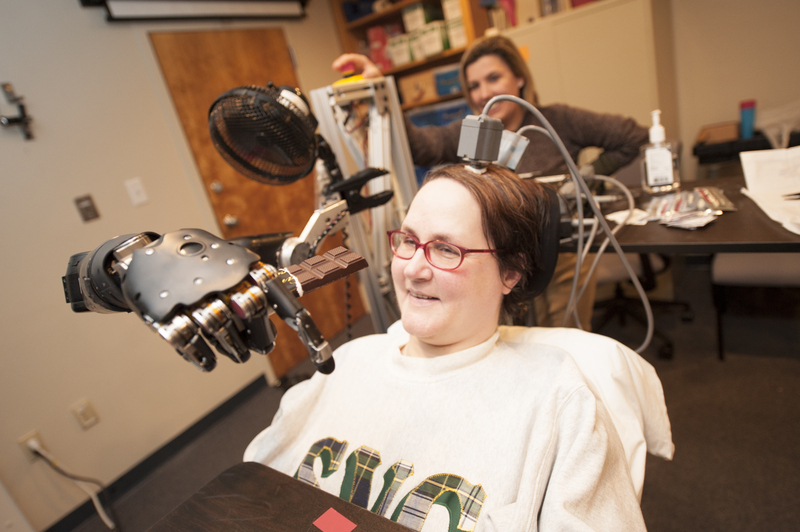 And for people with the most severe types of paralysis – high-level quadriplegia and “locked-in syndrome” – brain control of robotic hands can give people with paralysis a greater level of independence, even allowing one man to hold his girlfriend’s hand. I’m putting such a strong plug to vote for the Longitude 2014 Paralysis Prize for one more reason: it’s the underdog. And we shouldn’t be surprised. The fact is, almost all the other challenge areas – flight, water, food, dementia and antibiotics – involve things that most people can relate to, have heard of, and can understand in basic terms. Paralysis, on the other hand, is invisible. Its effects are generally not seen, because these populations are not seen. Spinal cord injury is considered an “orphan patient population” – one that affects so few people that here in the U.S., agencies such as the Food and Drug Administration have to put special programs together to encourage companies to develop drugs and devices for them. Finally, many of the technologies aimed at this patient population sit poised on the edge of commercial reality, but they will likely remain there because the commercial markets are so small. This is exactly the reason incentive prizes like the Longitude Prize are needed – they spur innovation in areas that are underserved. And by shining a spotlight on the needs of people with paralysis, we can bring important recognition to the efforts underway to restore basic movements and functions. If you are in the UK, please vote here for the Longitude 2014 Paralysis Prize. Or text PARALYSIS to 60011. If you are outside the UK, please help spread the word and encourage your contacts in the UK to vote for the Paralysis Prize. Disclaimer: If the Paralysis Prize wins the popular vote, my organization, the Institute for Functional Restoration, will compete. We feel strongly about the needs of people with paralysis and have spent decades developing systems to restore function. We think we have a good shot. PreviousWhy Crowdsource Conservation? Because, seahorses! I want to win paralysis but to win paralysis in my opinion doesn’t mean to walk again…. I could say it is ok to give all that money to robotic IF spinal cord regeneration was not possible but we know it is!! so, why don’t force researchers, giving them more money and support, to work faster towards a CURE? Robotic could help but a CURE solve the problem and I want the problem solved! Thanks for your comment. Most researchers believe we should do both, actually. The community is highly supportive of work on regenerative medicine, stem cell research, and early intervention at the time of injury to minimize damage, as well as methods to restore function. Research on all fronts has advanced the field considerably – today there are many more “incomplete” injuries thanks to our advanced understanding of acute management of spinal cord injury. Think of it as a two-pronged approach: while we are working toward a complete cure – the holy grail – we can also help the people who are out there right now who would like some function restored. These are different scientific disciplines attacking the problem from different angles. Exactly what you’d want for a collaborative approach. Thanks again for your comment.